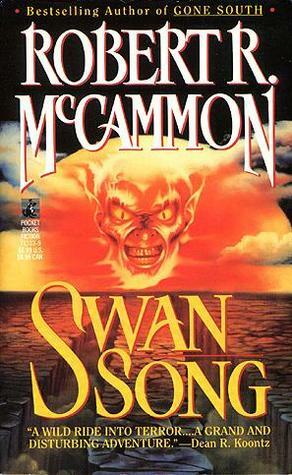 There are two features of Robert R. McCammon's post-apocalyptic novel Swan Song that have to show up in any discussion of the book. One is its epic, 960+ page length. The other, more troubling, is its suspicious similarity to Stephen King's classic post-apocalyptic novel The Stand. It's not identical or anything and in fact has many different components, but it still absolutely begs for comparison. The novel concerns the aftermath of a nuclear war and follows varous groups of survivers as they converge upon one another until a final confrontation between good and evil. The President of the United States doesn't want to press the button but feels powerless to stop an inexorable confrontation with the Soviets. In NYC, a homeless woman named Sister Creep hunkers down in a subway. Sue Wanda (nicknamed Swan, she of the book's title) has an uncanny connection to life around her and is traveling away from an abusive father with her mother. They meet up with Josh, a professional wrestler, big and burly but friendly and caring. Retired Colonel James Macklin runs a crumbling survivalist fallout shelter where he finds himself mentoring Roland Croninger, a thirteen year old boy enamored with his video game where he plays a "King's Knight". After the bombs fall, they all endure various hardships, meet friendly survivers as well as roaming bands of bandits, and choose their own good or evil path. They are plagued by Randall Flagg a mysterious "Man With The Scarlet Eye" who seems to have quite enjoyed the calamity imposed on the human race of late, and seeks to destroy all remaining vestiges of hope. So yes, very similar in size and scope to King's The Stand, if not in the particulars. Using nuclear war instead of a virus is a more bombastic and obvious choice, and makes for a good microcosm of the differences between the two novels. Where king goes for archetypes, McCammon goes for cliched stereotypes. Where King's novel portrays an epic confrontation between good and evil, McCammon's feels more perfunctory. Or maybe I'm just full of it. I haven't read The Stand in 20 years, after all. One thing that does strike me about King's book, though, is how memorable so many of the characters and scenarios are, and how clever all the ideas feel to me. Obviously I can't tell if Swan Song will survive the test of time just yet (having just finished it), but despite being published 9 years after The Stand, this just feels more dated and derivative. This isn't my first tango with McCammon and he is clearly a talented storyteller who knows how to turn a page. The book is lengthy, but it never felt particularly longwinded while I was reading it. In retrospect, it could probably be tightened up, but I found it compelling enough to finish it in relatively short order. I really love Swan and Josh's story and while it took me a while to warm to Sister, she had grown on me by the end. Roland and Macklin are a little more on the cartoonishly evil, Road Warrior-esque side of things, and never completely worked for me, though they did represent a tense threat. The Man With the Scarlet Eye is suitably creepy for most of the story, but feels oddly unfulfilled in the end. Some of the side characters are fantastic, others are less successful. Some of the more mystical elements work to an extent, but also feel more inflated and ultimately pointless. For instance, Sister finds a magical glass ring, fused together with jewels during the nuclear attack. It glows, shows visions, and can act as a sorta rosetta stone, among other abilities (it cauterizes wounds too!) Eventually, though, it just feels like a convenient plotting device rather than something truly important. Then there's the idea of the Job's mask, ugly growths that cover many survivors' faces. Several years after the attack, the growths painfully crack and fall off, revealing... well, if you're a good person, your inner beauty becomes outer beauty. If you're evil, you become hideous. Not very subtle there, but I'm glad McCammon acknowledges at least something about the potential difficulties of exposure to radiation, even if it is complete hokum (incidentally, I'm pretty sure all these characters would die of radiation poisoning, but this isn't SF and I won't hold it to that standard). The ending of the book did surprise me a bit because McCammon went for an optimistic, happy resolution. Given the grimy, pessimistic opening of the book, this was welcome for me, but I can see it being too saccharine for others. I've done a lot of complaining here, but this isn't a bad book. It's mostly enjoyable and well written, but it is quite derivative and a bit perfunctory. Damning with faint praise, I guess, but it was a decent fit for the Six Weeks of Halloween marathon. If you haven't read The Stand, I'd recommend that over this. 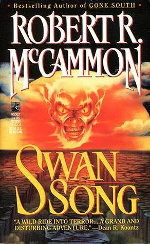 McCammon is still an interesting author, and I'm definitely curious to try out more of his stuff. I read his book Boy's Life around the same time as The Stand and remember enjoying that quite a bit (though I must admit, I don't remember anything about that book), and he's written a couple other books I'd be interested in checking out. Anywho, more season's readings coming in the nearish future, so look for some Clive Barker and maybe even... Batman? Yes, Batman.